The only good thing about reviewing a game that relies entirely on online competition but was, for a few days, almost impossible to play online is that it gives you some time to spend with other games. So while Capcom was panicking to rebuild Street Fighter V’s online infrastructure, I nabbed a little game called Devil Daggers off Steam after a tidal wave of buzz for it demolished my Twitter feed, and ever since, I’ve been logging a few minutes with it any chance I get. In our age of slick aesthetics and complex game design, Devil Daggers feels like a dispassionate, Brutalist counterpoint. It’s an endless first-person shooter where you run around a floating arena and try to kill everything that moves before they kill you, which usually happens in under 60 seconds until you get the hang of things—and even then, you’re lucky to last much longer than that. The horrors that you face look like they’ve been stripped straight from a grimy, heavy-metal-loving PlayStation 1 game, all nondescript skulls and bugs and tentacled demon-spawning obelisks shrouded against a backdrop of pure darkness. The only weapons at your disposal are your wits, your agility, and the infinite daggers you can shoot from your hand in either a concentrated shotgun blast or a machine-gun-like hose of death. If you collect enough crystals from the corpses of your enemies, your daggers will become more powerful. Reaching even the first of those level-up moments is a grueling challenge, but the sudden empowerment it bestows is delicious. While the perspective and look have been changed dramatically, the act of playing Devil Daggers has just as much in common with Geometry Wars as it does Doom. The key to survival is to be constantly on the move, leading a swarm of demons around the tiny arena as you clear away as much of the threat as you can before you’re inevitably overwhelmed. Its power to evoke the feeling of being chased is especially potent, in part because of simple, well-crafted sound design. Each of the enemies in the game—there are only several kinds—makes a different sound, and if you’re playing with headphones or have a decent audio set up, you’ll hear those noises coming from the appropriate directions as you frantically circle around the battlefield. In a game as stark and stressful as this, that added layer of a knowing exactly where a looming threat is coming makes a huge difference. 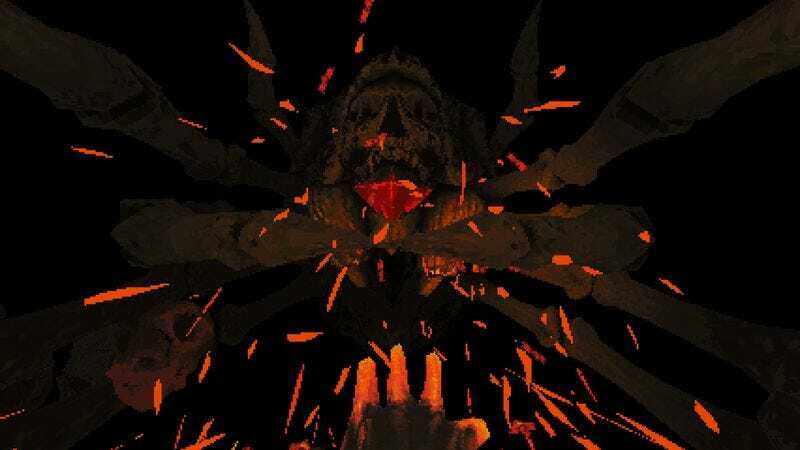 There’s nothing in Devil Daggers more horrifying than hearing the telltale panting of an enraged horned skull get closer and closer until you finally decide to turn around and see the monster right before it devours your face. Unlike most of the games of this ilk, Devil Daggers is not completely procedurally generated. You’ll always be facing the same threats in the same order, though their exact locations on the map do seem to change. That you’re able to take in the game’s fiendish assault, assemble a strategy, and slowly press your way farther makes Devil Daggers even more of an irresistible Sisyphean nightmare. Sometimes you’re able to roll that boulder the tiniest bit farther, but no matter how far you make it, the skulls always win, and you always start again from the bottom.